Sawmill ENTERPRISE brings all the features of Sawmill PROFESSIONAL and adds improved scalability, extreme customization functionality, and support for MySQL, Microsoft SQL Server, Oracle Database, and Role-based Authentication Control (RBAC). Sawmill ENTERPRISE is intended for organizations with existing enterprise database infrastructure, a hierarchy of users needing highly granular access to Sawmill functionality, and/or a need for up-to-the-second reporting from a large log dataset being continually imported into Sawmill's database. Designed for processing very large datasets, it outperforms Sawmill PROFESSIONAL on both log import and report generation, when run on a fast multiprocessor server. Sawmill ENTERPRISE processes log data faster, by splitting log parsing across many processors (or cores). This can give a nearly linear speedup when processing large logs on a multi-core system, so an 8-core system can import data in 1/8 the time, during log import, the first stage of a database build. Sawmill ENTERPRISE also uses all processors and cores when running large queries. This speeds up some database building operations, for faster data import, and also speeds up some large reports. Together, these make Sawmill ENTERPRISE an excellent choice for anyone with a large dataset to analyze. Sawmill ENTERPRISE takes database support to the highest level with the option to use a Microsoft SQL Server or Oracle database as the back-end database, to store the collected data and generate reports. With ENTERPRISE, you can use all the power, flexibility, scalability, and redundancy of an enterprise database server, with the Sawmill importer, analytics and reporting engine, and interface. Sawmill ENTERPRISE also supports MySQL as the back-end database. This is useful for existing MySQL environments, where the imported data is to be queried with SQL; or where a high-end MySQL database is available for high performance, backup, clustering, and other high-end MySQL database features. Sawmill ENTERPRISE also provides highly granular control over user access, through its Role-Based Authentication Control feature. Users can be given exactly the permissions they need; for instance, they may be permitted to update the database of a profile but not rebuild it; or they may be allowed to edit log filters but not add new ones. This gives you the flexibility to provide exactly the access permissions needed to each person using Sawmill: no less, and no more. Sawmill ENTERPRISE also supports full editing of the source code of the web interface, for complete customization and programmability of all aspects of the user interface. Sawmill ENTERPRISE may be run on any of the Supported Sawmill platforms (Unix, Linux, Windows, Macintosh), and can be run either locally (on the 'server' being analyzed) or remotely (on any system you want, anywhere you want). When run as a remote application Sawmill ENTERPRISE will automatically download the target log files, process them, and either publish the reports using its integrated web server, or email the reports to wherever you need them. 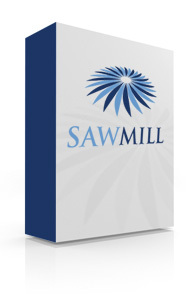 * There are license restrictions on the Sawmill Logo and the Flowerfire copyright notice. See the EULA for more info.